The tart taste of rhubarb is not very appealing without a sweetener. It's good for stews ans soups, and you can try them. Some people eat rhubarb even fresh dipped in sugar. No matter where you're going to add rhubarb, just don't use the leaves. They are mildly toxic due to oxalic acid. Rhubarb is perfect with some sweetener, that is why it's so popular for ice cream, jam and pie filling. 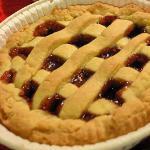 Rhubarb pie is very popular, and one of its variations, strawberry rhubarb pie, is known to everyone. Rhubarb originated in northwest China, where it grew wild. The Chinese began cultivating it in medicinal purposes and this vegetable made it's way to Europe via Turkey and Russia. Benjamin Franklin introduced rhubarb to the USA in the end of the 1700s and in the beginning of the 1800s it became very popular. As the strawberry season begins, use it for filling together with rhubarb to bake a pie.